"Brightpod is beautifully designed and a very intuitive service that will help you manage your projects more efficiently." "I can visually track how my projects are progressing." 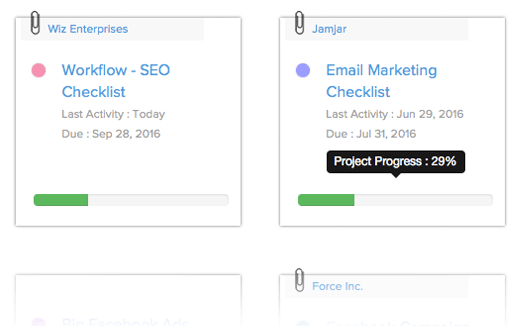 Easily, get a birds-eye view of each of your pods (projects) and how they are performing. Visual color indicators and progress bars easily helps you see which project is approaching (orange) its deadline and which one is overdue (red). You can even choose a unique color for each project to easily distinguish it on the calendar. "Delegating & tracking recurring tasks is simple again." Display task lists and tasks as Kanban boards. You get to see the flow of the project (the big picture) and your team knows what they need to do. You can even assign multiple people to a task! Track list of blogs relevant to your industry or Plan 90 day marketing goals and get feedback from your team. Recurring tasks lets you repeat tasks. e.g. Send client reports every Monday. "I can stop wasting time & automating similar projects." 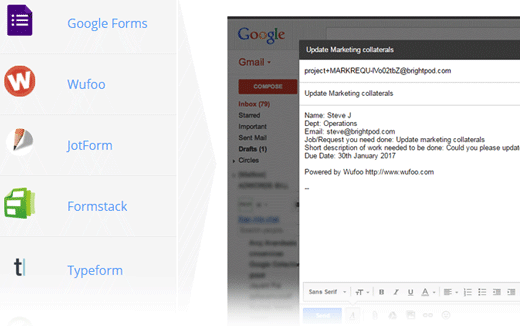 Create workflows to help similar projects run smoothly and plan faster. 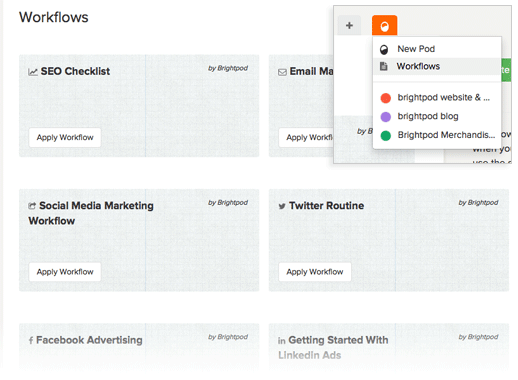 You can also save your own workflows and reuse them since a lot of marketing tasks can be repetitive. "My social media & content strategy in one place." 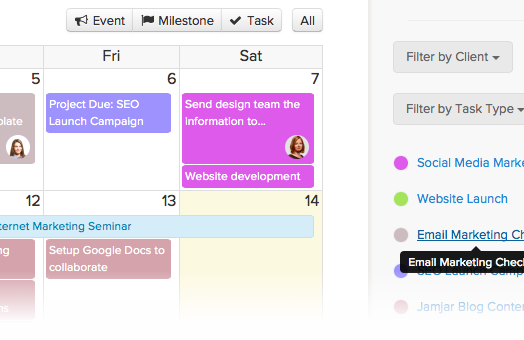 A unified drag and drop calendar lets you and your team plan content across all your projects. We'll go one step further to let you even plan your events on the same calendar. "The key to productivity is to focus on a few things." The key to daily productivity is to focus on a few things. Focus, as its name implies, is designed to help you focus on just some of your tasks. 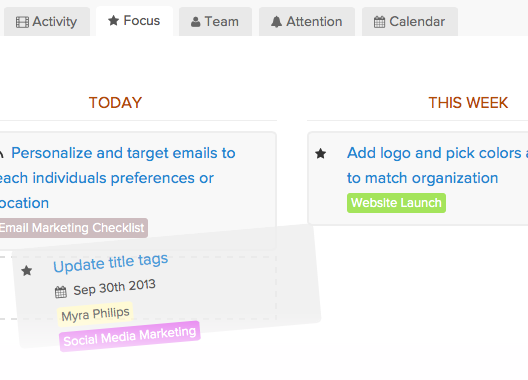 Tasks requiring Focus are displayed with a star. You can move these tasks around and plan your week. 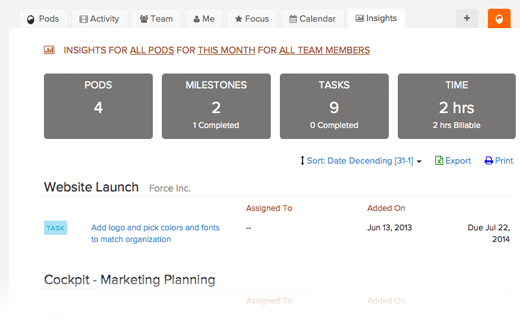 With Focus, we built a little bit of personal productivity into this project management system. “Cross-project prioritization helps you make your team stay on top of all high priority work." Log in every morning and head straight to the Me page to know what you have to work on or who do you need to nudge. The Me page will display all tasks by a person across all his/ her projects. Prioritize tasks (by a simple drag and drop) across projects and seperate the important from the urgent. "Remember: time is money, track it wisely." 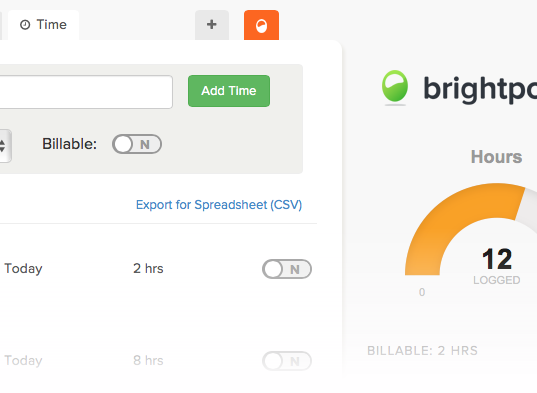 Budget time for each project, add time estimate to tasks, add actual time for each task, add custom time entries, choose between billable and non-billable, filter time by team members and even export all your time to a spreadsheet. By the end of the week you'll know how much time is being spent on each of your projects and which tasks are ballooning out of control. 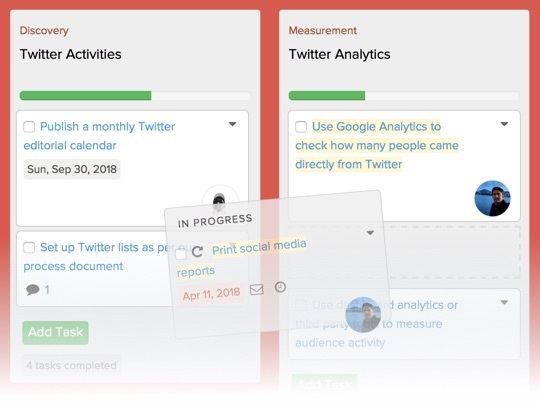 Insights (our take on reporting) will show you when a project, milestone, task, time was added, completed, due by any of your team members across any of your projects and during a particular time interval. 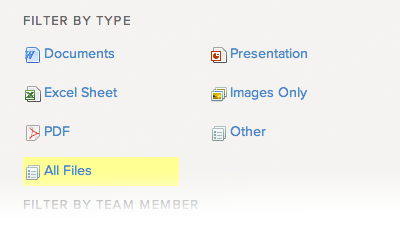 Every pod (project) comes with a Files page where everyone in your team can upload files and keep them organized. In addition, you can upload files when adding a comment to a task or a message. Brightpod supports uploading files via Google Drive, Dropbox and Box. Your file will still reside in the storage platform of your choice. Brightpod will only link to that file. This eliminates the need to constantly update a task or a message with the latest version of the file. A milestone is a marker or a goal that you want to achieve for a list of tasks. 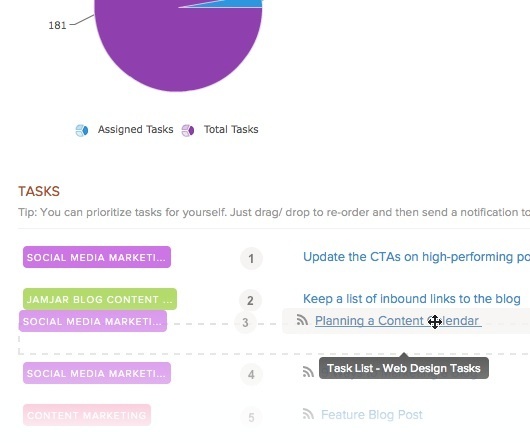 When you create tasks, they are in task lists. 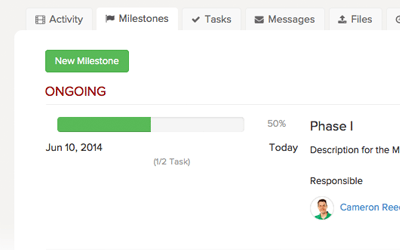 A task list can be associated to a milestone. For example, you could have a milestone called "Phase 1" and then have tasks associated with that milestone. As you complete your tasks, you will be able to see the progress of your milestone as well. Need to discuss a website banner image with the team? Instead of sending emails back and forth, create a new message and then share your image with your team. You can attach your file from your computer or use Dropbox, Google Drive and Box. Your teammates can like your message to give praise or show their approval. 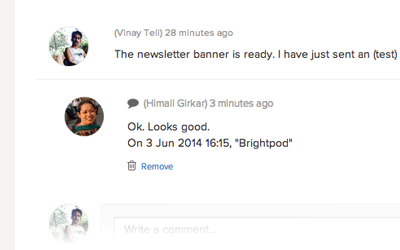 Send in requests from a custom form and capture those request in Brightpod. This is useful when you have other departments sending in requests that your team needs to get done on time. Easy setup, simple to use & powerful. Upload your company logo, choose pod (project) colors, define task types and more. Work from your mobile device. Simply participate in discussions by replying to emails. Receive a daily email notifying you of what happened the previous day and a list of your overdue work. Easily tap into your docs on Google Drive, Dropbox or Box from Brightpod. With Archive, we have got your back. You can retrieve anything that has been removed within 30 days. We have got your back again! Comments are saved even when you accidentally close the window without clicking Save. Neat tool from @brightpodapp if you're looking for a calendar! After testing endless task/project management systems, I really enjoy Brightpod's structure and think it's on the edge of revolutionary.